English Electric Type 4 1Co-Co1 D255 is seen approaching Dunchurch with the diverted 10 13am Birmingham New Street to Euston express service. Built by English Electric between 1958 and 1962, the Type 4 locomotives were reclassified as Class 40 diesel locomotives. They were for a time the pride of the British Rail early diesel fleet however, despite their initial success, by the time the last examples were entering service they were already being replaced on some top-link duties by more powerful locomotives. As the Class 40s were slowly relegated from express passenger uses they were cascaded on to secondary passenger and freight services where they worked for many years, the final locomotives being retired from regular service in 1985. 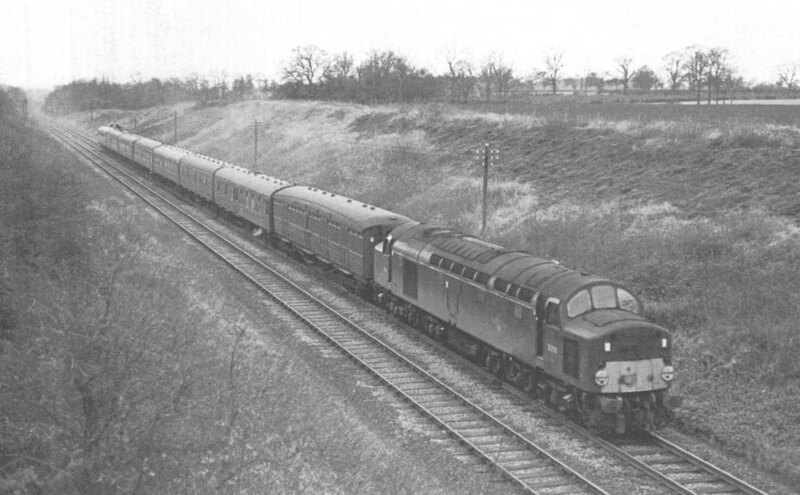 The origins of the Class 40 fleet lay in the prototype diesel locomotives (Types D16/1 ordered by the London, Midland and Scottish Railway and British Railways and D16/2 ordered by British Railways between 1947 and 1954) and most notably with the Southern Region locomotive No. 10203, which was powered by English Electric's 16SVT MkII engine developing 2,000bhp (1,460 kW). A development of this engine was used in the production Class 40s. British Railways originally ordered ten Class 40s, then known as "English Electric Type 4s", as evaluation prototypes. They were built at the Vulcan Foundry in Newton-le-Willows, Lancashire with the first locomotive, D200, being delivered in March 1958 and making its passenger debut on an express train from London Liverpool Street to Norwich on 18 April 1958. Five of the prototypes, Nos D200-D204, were trialled on similar services on the former Great Eastern routes, whilst the remaining five, Nos D205-D209, worked on Great Northern services on the East Coast Main Line. After the success of the prototypes, another 190 locomotives were ordered by British Railways, and were numbered from D210 to D399. All were built at Vulcan Foundry, except a batch of twenty (Nos. D305-D324) which were built at Robert Stephenson and Hawthorns factory in Darlington. All the locomotives were painted in the British Railways diesel green livery, and the final locomotive, D399, was delivered in September 1962. Courtesy 'Wikipedia'.